1 Set of storage batteries and tanks. 1 Westinhouse motor nº 28292. 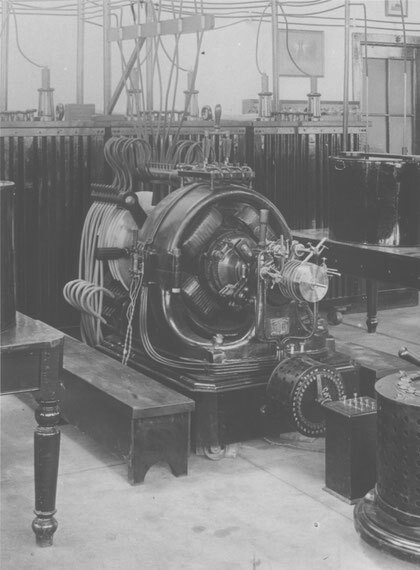 1 Westinhouse motor, type C, 5 H.P. nº 62320. 1 Westinhouse motor, type C, 5 H.P. nº 22070. 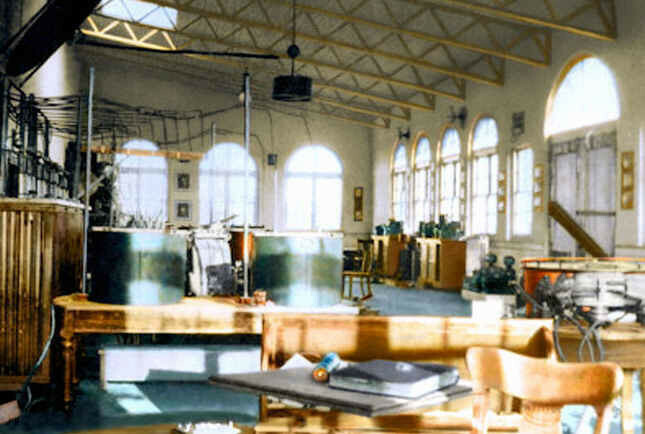 4 High tension transformers in tanks; and switchboards. 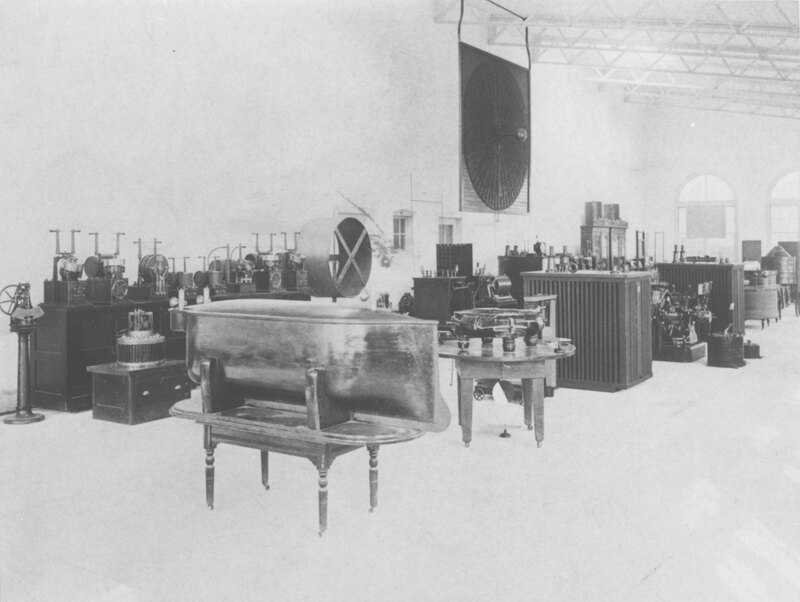 Interior view of Tesla's Wardenclyffe plant showing various electrical apparatus, including the large telautomaton, "Egg of Columbus," and various transformers. Circa 1902. 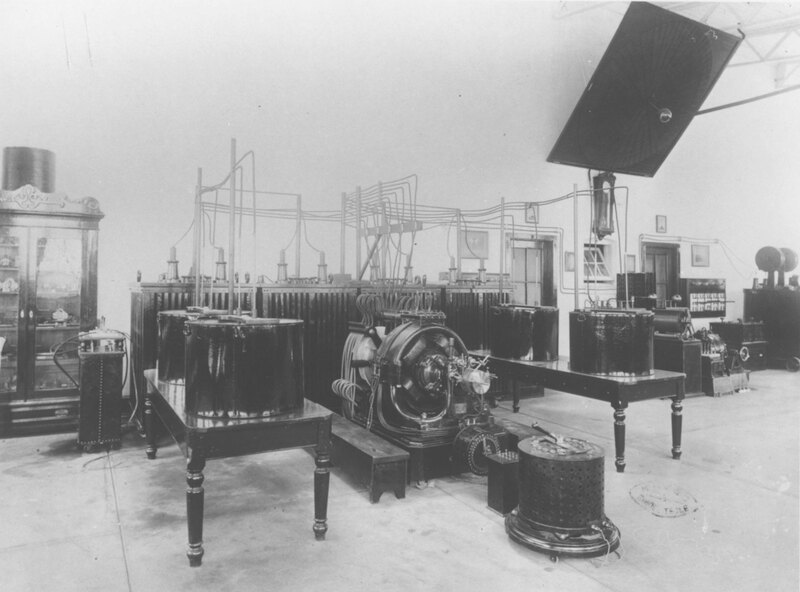 Interior view of Tesla's Wardenclyffe plant showing various electrical apparati, including a tuning table, two-phase dynamo, various transformers and oscilators, and large spiral coil. The telautomaton and "Egg of Columbus" are in background. Circa 1902. In June of 1902, Tesla moved out of his laboratory on Houston Street and into the Wardenclyffe building. 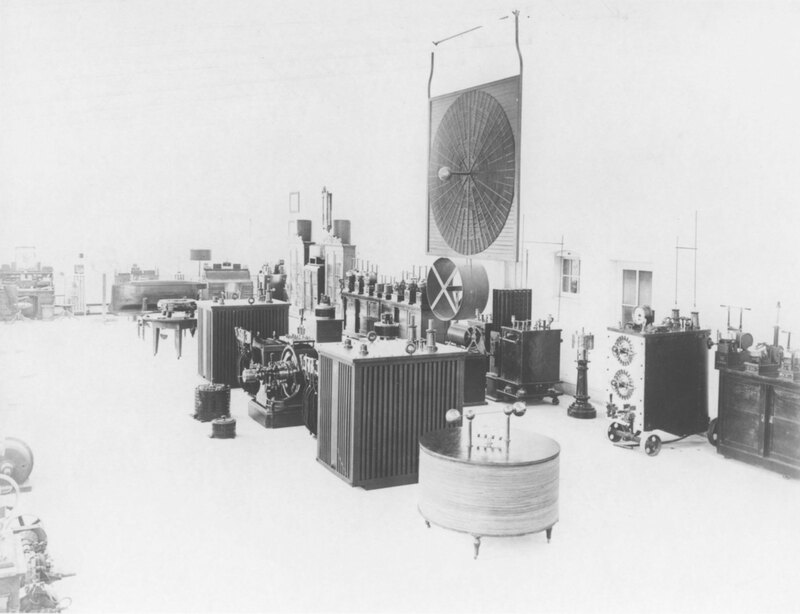 The laboratory section was soon filled with lecture equipment, coils, X-ray machinery and other devices. In the workshop, glass blowers were busy making the electron bulbs that Tesla hoped to use in his receivers. When it became generally known that the Wardenclyffe operation had closed, an occasional research engineer bitten with curiosity would make his way out to the laboratory. If the caretaker was still there, the visitor would be admitted for a tour of the laboratory. What he would behold was something quite beyond his expectations —intricate mechanical mechanisms, glass blowing equipment, a complete machine shop including eight lathes, X-Ray devices, many varieties of high frequency (Tesla) coils, a radio controlled boat, exhibit cases with at least a thousand bulbs and tubes, an instrument room, electrical generators and transformers, wire, cable, library and office. A strange stillness filled the building. It seemed as if it were a holiday, and the workday tomorrow would bring back all the workers to their assignments. A walk outside to the tower and up the flights of stairs—soon one caught the whisper of the wind through the spars. One believed he could perceive muted voices and clanking sounds below. But the switch had not been thrown. The dynamos stood idle. In 1912, Westinghouse, Church, Kerr & Company obtained a judgment against Tesla for $23,500 for machinery furnished at Wardenclyffe. The equipment was subsequently removed. In order to keep a roof over his head, Tesla had given two mortgages on Wardenclyffe to George C. Boldt, proprietor of the Waldorf-Astoria, to secure payment of hotel bills amounting to $20,000. Tesla requested that they not be recorded fearing that all his project's would be destroyed if the matter became public. He was unable to make any payments at all, and in 1915 he turned the Wardenclyffe deed over to Waldorf-Astoria, Inc., through a silent intermediary.